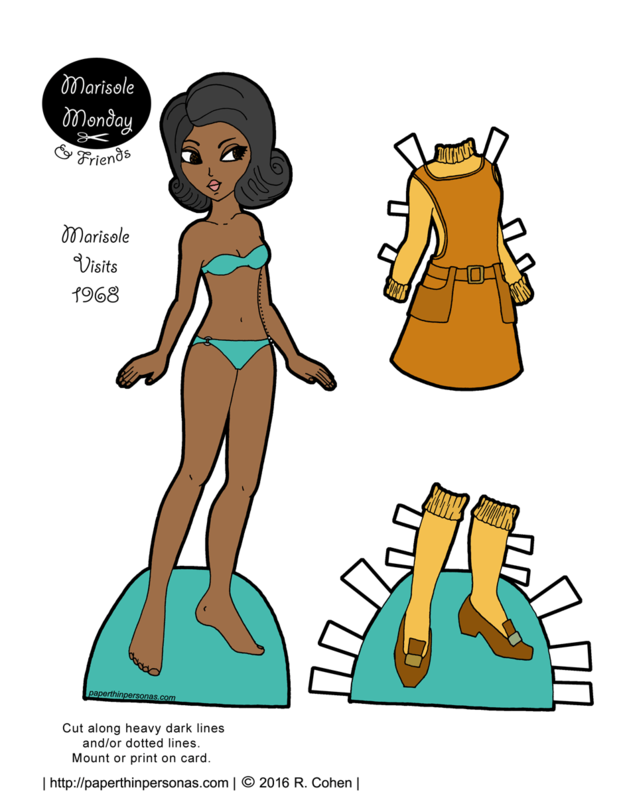 So, back when I decided in December to do a winter paper doll each week, I did what I often do. I messed around on Pinterest and went looking for ideas. A lot of what I saw were those Christmas Barbies and I think a little of that went into this dress. Today’s Min-Seo paper doll’s dress is sort of weird medieval fantasy meets an ice staking costume. Or, in other words, Camelot on Ice. Everything is better on ice. And the thing you need to do with such a gown is clearly fur trimmed blue booties and a pageant sort of up-do. Why not? What are you losing? The dress is already absurd. So, I say- go for gold on the absurdity scale. Plus, somehow in my head “winter = fur trimming” and I can’t seem to shake that. Not even sure I should be trying to shake that, but that’s neither here nor there. Meanwhile, if you like the blog, then consider donating through Patreon, plus there’s a behind the scenes blog and early paper doll previews and other fun content. For example, earlier this week, I posted my annual Year In Review 2016 post. Also, to my Patrons, Patreon is having some issues with their email system. So, if you usually get an email to know when I post there, you might want to pop over and see if you missed anything. I will let you know when the problem is resolved. 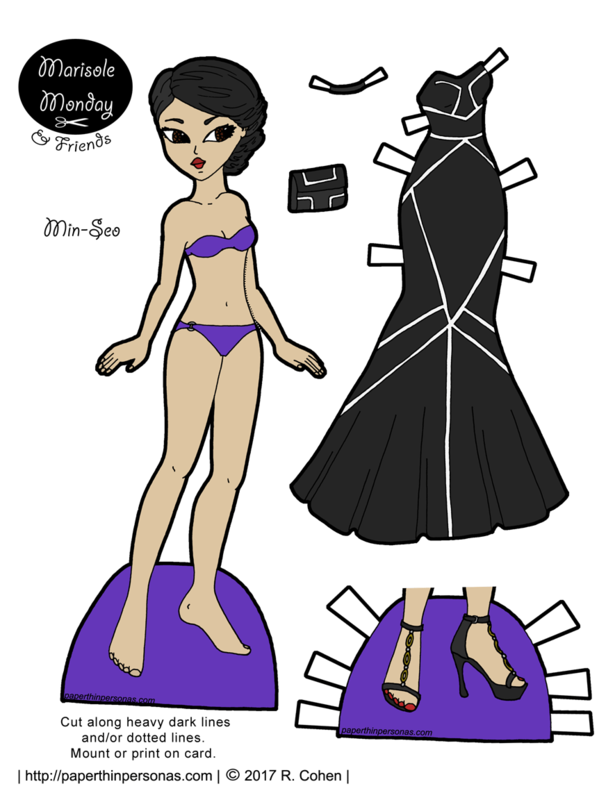 And this ends Min-Seo printable paper doll week. Regular blog posting will continue next week. I love love love 1920s fashion. I can’t help it. Now, as I mentioned on Monday, Min-Seo is a Korean name. I really don’t know much about the introduction of western style dress to Korea. However, Korean immigration began to the United States in 1884, mostly to Hawaii. So, it’s entirely possible that Min-Seo could be living in the United States in the 1920s. It is also entirely possible that I am way over thinking this. It’s not like I worry about the fact that the name Meaghan didn’t exist in the 1300s and she still has 1300s clothing. For those who have missed my other forays into 1920s fashion, you can find them all in the 1920s tag. 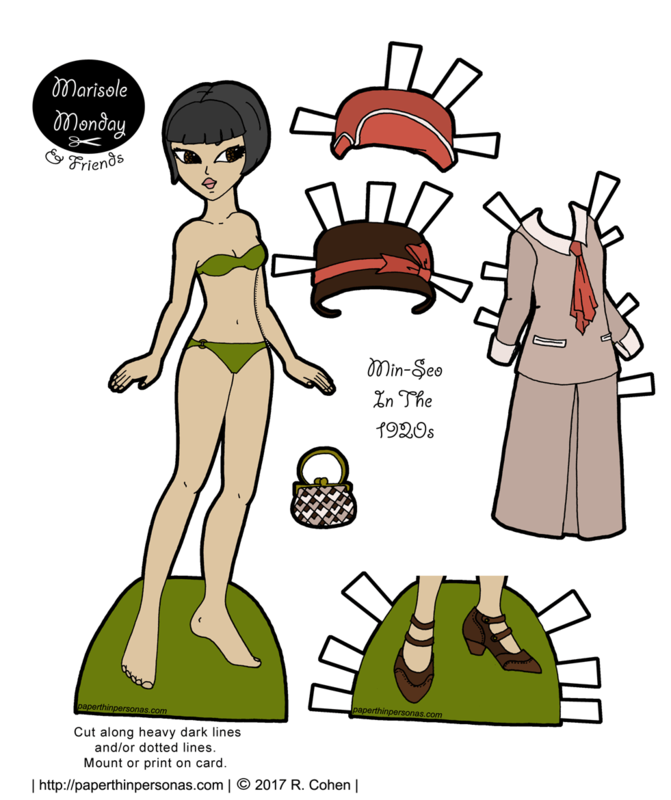 There are two other 1920s Marisole Monday & Friends paper dolls. Jazz Age Baby in black and white or in color and Art Deco Goddess in black and white or in color. I have several more 1920s dresses scanned and drawn, so there will be more from this era, but I don’t know when. As always, it can be a long slow period between drawing and posting. I have a golf outfit that is pretty darn cute, so I want to get that done soon. If you would like to support the blog, then donate through Patreon. It’s always appreciated. Sometimes, I get to design fun and absurd fantasy gowns inspired by the Tudors. This is totally one of those times. 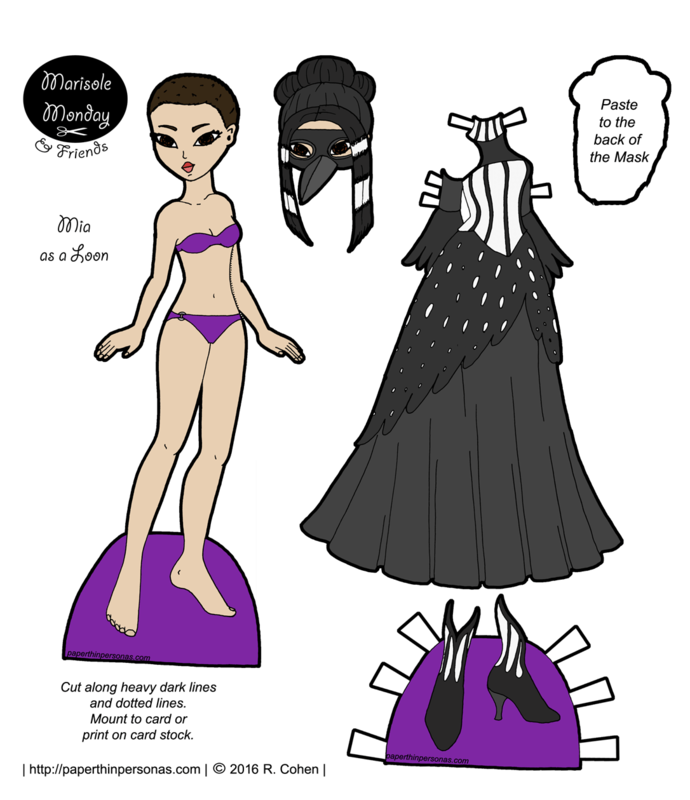 I knew I wanted to do a fantasy Min-Seo paper doll, because I do so many fantasy dresses. Because of the stiffness of the clothing, a Tudor fantasy gown is a really great opportunity to play with elaborate pattern. At first, I conceived of the pattern on her skirt being snowflake inspired. Since, I didn’t want to make yet another blue and white and grey winter gown. When I actually started coloring it, it stopped looking much like snow. I do think the eggplant/magenta color on the gown does feel autumnal to me. I can’t imagine this a summer gown, but I’m not really sure it is a winter gown. What do you think of my color scheme? Should I have stuck with my blues and grays? As often happens with paper dolls who’ve got black hair, I feel like the complexity of her hairstyle got a little lost. It’s much more clear in the black and white coloring page version. No matter how you slice it, black line-work tends to disappear against dark dark grey I use for hair. I also gave her black toenails, because it amused me. No other reason. Painted toenails were not a Tudor thing, but that’s why I say Tudor fantasy gown and not Tudor gown. So, this gives us one punk Min-Seo from Monday. Today’s Tudor fantasy gown wearing Min-Seo. Tomorrow there will be a historical Min-Seo paper doll from the 1920s, so stay tuned. As always, if you love the blog, then think about becoming a patron and/or leaving a comment. Always love to hear from you guys. Need a more outfits for today’s Marisole Monday & Friends Paper Doll? Find More Clothing for the Ladies Here. Min-Seo is a Korean name. The meaning changes depending on the characters used to spell it. It’s also the name of Kim Min-Seo, a Korean drama actress. Korean names, like Chinese names, use the family name first and then the personal name. Anyway, I sketched out this face a few months ago, but I wanted to wait to introduce her until it was the new year. So, this whole week is Min-Seo paper dolls and outfits. I figure that way she can catch up a bit with the other ladies of the Marisole Monday & Friends crowd. The first Min-Seo paper doll is a punk fashion girl rocking some blue hair, black nail polish and a pair of amazing boots. Seriously, I want those boots. I don’t know where I would wear them, but I want them. 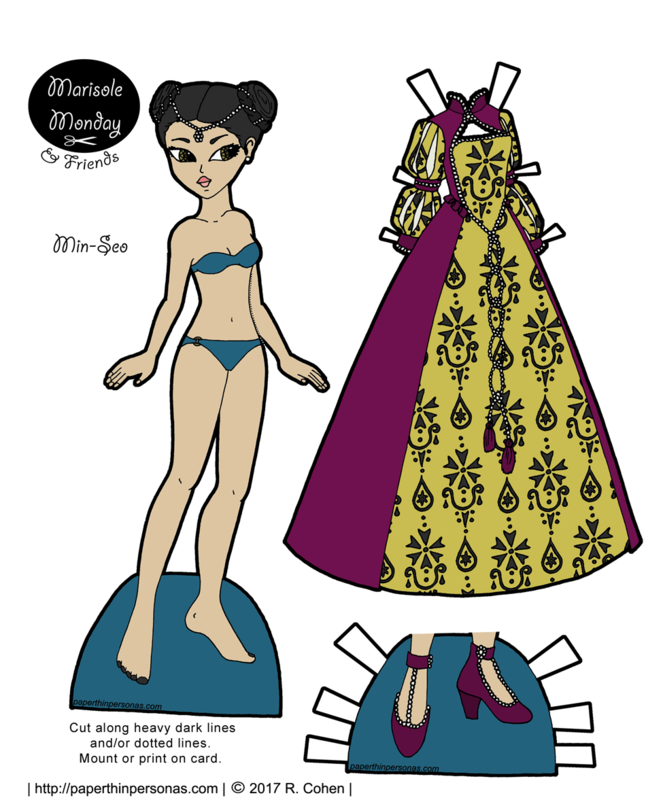 So, what do you think of the first Min-Seo paper doll? Let me know in a comment. Love the blog? Want to donate? Become a Patron.